Pittsburgh: A New Tech Hub? Pittsburgh, which was founded two centuries ago in 1816, was one of the great economic centers of the United States. It was the 8th biggest city by population in 1920, and it peaked at over 700,000 in the 1940s. A geographic center where the rail lines met between cities including Chicago, Cleveland, DC, and New York, Pittsburgh was the home of great industrialists including Mellon, Heinz, Frick and Westinghouse, to name a few who many of us still recognize today. During the second world war, Pittsburgh itself produced as much steel as each Axis power and was at the heart of American industrial success. But to my generation that grew up in the 1980s and 90s, the word Pittsburgh evokes an image of abandoned giant metal factories, rusting bridges, and a huge dying city. As the mills closed at the end of the 1970s and unemployment spiked to enormous levels, the job of the city leaders became one of managing decline for many years; the population has steadily dwindled, down to 305,000 today. 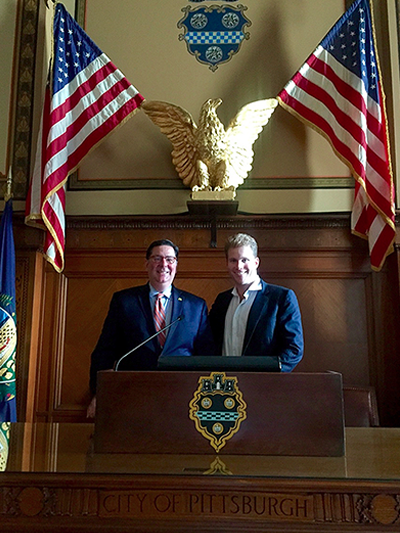 Joe Lonsdale and Mayor Bill Peduto, at Pittsburgh City Hall, built with extreme grandeur in 1916 for the city’s centennial;. The mayor commented that some of the exotic wood used by the talented craftsmen is now extinct, and speculated what citizens would do to him were he to try to spend tax money on a building like this today. Despite this trend, many signs of revival are emerging from the ashes of this rust belt giant. Great universities such as Carnegie Mellon (CMU), University of Pittsburgh, and Duquesne still attract top talent–CMU, for example, is currently ranked the number one U.S. graduate school for Computer Science (CS). Google has hired over 800 people in the city; Uber is building its self-driving lab and testing cars on closed streets; Oculus, Microsoft, and tens of others are building offices. Palo Alto may be an attractive tech center, but Pittsburgh has a not-insignificant cost of living advantage; single-family homes go for around $70,000 and extraordinary mid-century mansions with ten bedrooms and tiffany windows go for $400–500k… twice that amount, a million dollars, barely gets you a one-bedroom starter apartment in Palo Alto. Pittsburgh has remained an interesting place to live as cultural institutions sponsored by endowments left behind from great industrialist families have continued to support art collections, design programs, and other city life; the mayor and his staff says it was a combination of the universities and these endowments that kept the city alive through the toughest times. And now it is starting to bloom again. Our entrepreneur friend Matt Michelsen got to know Pittsburgh Mayor Bill Peduto and his staff, as well as the CS deans at CMU, and my partners Alex, Kimmy and I and other teammates were excited to spend time with them this last Friday on the way back to CA from NY. The city has put in meaningful tax incentives that make it interesting for young companies to open up offices in Pittsburgh, and we’re excited to talk to to our companies about them. It’s refreshing to talk to city leaders who care about helping businesses get what they need, whether it’s a test track for Uber or the right connections with the city’s robotics centers and experts. 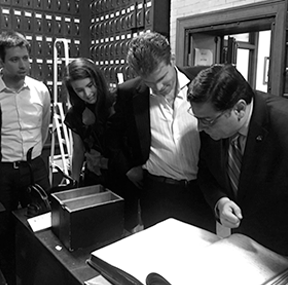 Mayor Peduto (right) leads Alex Kolicich, Tayler Cox, and Joe Lonsdale, on a tour through the city archives. Until the 19th century, the city council was divided into a Commons Council and a Select, much like the House of Lords and House of Commons in Britain, or the original Senate and House of Representatives in the U.S. federal government. CMU helped create the field of machine learning and artificial intelligence, and the amount of talent and leadership at CMU that is eager to engage with top companies and apply their ability to solve important problems is amazing. Andrew Moore is a very respected technologist who built a machine learning group for Google in Pittsburgh, and is currently one of the CS deans at CMU. His vision and leadership made the excitement of the city and innovative energy of the university palpable. The deans were excited to structure more of the projects going on around the university as mission-driven startup companies, and as the city and its talent becomes more connected to the technology economy, this seems likely to happen at an increasing pace. Smaller amounts of funding seem like they can go really far here, and 8VC’s angel investors are already following up with several of the professors. Of course, high-end metalwork and industry is still a big part of the local economy. We also discussed our company Hyperloop One, which we thought should explore the talent and capabilities in these industries as it expands to new offices in the coming years. Today, of course, everybody gets around on airplanes. But were 700 mph + train routes to be installed on the eastern seaboard, Pittsburgh would once again be at the center of a lot of the most important cities in the area, and suddenly, within easy (<1 hour) day trips of each, would would make it a very interesting place to base operations for a variety of businesses. 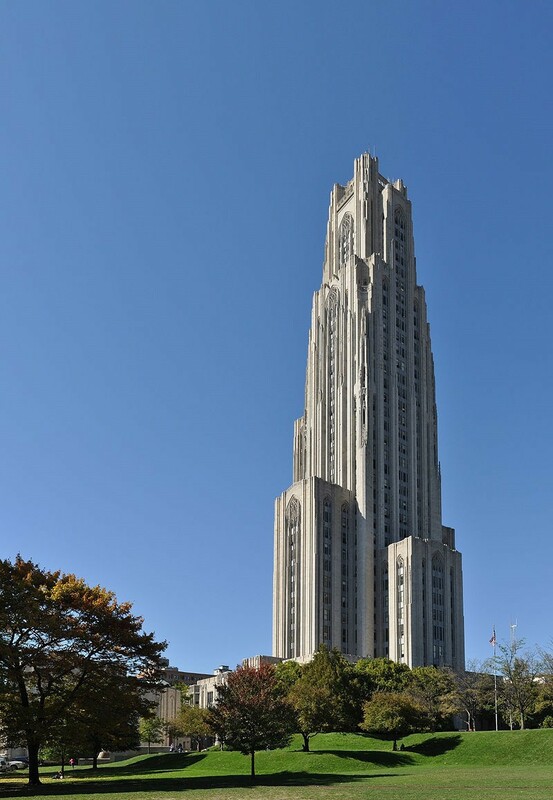 The Tower of Learning at the University of Pittsburgh, an Art Deco masterpiece built during the Great Depression. Many people who read about rust belts and decline may not realize that Pittsburgh is an aesthetically beautiful place. Some of the soaring old industrial spaces that can be rented for very little would be really fun to set our designers loose on to make into hip startup offices; probably much cooler than anything we have in California. And in general, there may be some rusting bridges, but the great buildings and city landscape were created at a time when American architecture was at its peak. It’s perhaps a blessing in disguise that the city wasn’t building as much during the brutalist period, or erecting the strip malls and boxed buildings that were thrown up all over America from the 70s through the 90s; Pittsburgh instead retains a charming, mid-century feel. The city hall, built with elements of the Pitt family crest as its theme for the 1916 centennial celebration, evokes the confidence and grandeur of a leading city of America’s past. Speaking to the deans at CMU and the mayor, and seeing talent and ambition start to move back into this old industrial city, one cannot help but feel that the grandeur and pride isn’t just relevant to the past, and that Pittsburgh may yet again play a significant role in our nation’s future.